Sometimes I start an entry about a newspaper or magazine article, or a website that caught my attention. I don’t have time to write anything about it at the time, I save it as a draft, with the intention of coming back and writing about what it was that was so interesting. I recently looked at the list of items marked “draft”, if I took time to write up an entry for each draft item, I’d have something written more than the once a week I’ve been writing lately. “Zen crocheting” and “Add ‘A New Stitch’ to the Pattern of your Life”, both from February 2005. “The Step Child of the Fiber World gets some cred from the cool kids” and “Knit Like a Man” from May of 2006. Some of those titles sound like they might have been interesting posts. I should spend some time reviewing the links, and what I’ve already written and see if I can get a few good posts. 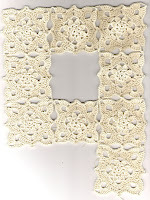 I've scanned a swatch of the Bernat Jr. Jaquards worked in Tunisian Knit stitch. The colorway is called Grape Juice, isn't it lovely! The colors on my moniter don't match the color of the yarn, it's much brighter in real life. (I wonder if I need my moniter adjusted, or maybe it's in the scanner software.) It's also very soft. This would make a lovely sweater for a baby or a toddler! This entry might be subtitled "Looking at things a little differently". Today, I was looking at a runner that I started earlier this year in #10 thread. (See the entry for March 12, 2008). I have also been thinking about what I could make with the remaining NaturallyCaron Spa, the bamboo/acrylic blend that I used for the Ring Around the Posie top. I have 3balls of the Spa in a color called Ocean Spray, I think it also could be called Seafoam green. I also have one ball of yellow from a class at the Conference. Probably not enough to make a top, or a shawl, but I thought that maybe if I used the yellow for flowers, and the green for leaves, that I could buy some white and create a motif design. Then I could join the motifs and make a top. 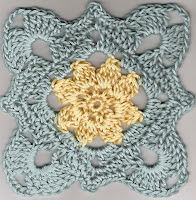 So I tried the yellow and green in the Lacy Flowers motif pattern from the runner. This is beautiful, I think that it might make a lovely and soft afghan, throw, or bedspread. Notice how different this motif looks by changing the size and type of fiber, and using a single color or changing colors. Whoops, while checking out this post, I clicked each picture and looked at the large photo. I noticed that on the last round of the green I actually skipped several single crochets before the final joining. I'm glad that I was only swatching for ideas and hadn't joined this into a major project as is! I left NC about 10:30 yesterday morning. After taking a scenic, leisurely pace for the first few hours with several stops, I finally settled into a rhythm of driving fast for long periods, then taking a short stop. I arrived home from NC about 9:30 last night. Hubby made dinner for me while I unloaded the car, I made a quick sort through the mail, then settled in to eat and watch the Olympics. I opened my suitcase and took out pjs, toothbrush, hairbrush, etc, but will need to unpack today. I also started reading Bendy Carter's book which had arrived while I was gone. Called Dying to Crochet, it's a "blended genre" book. There's a nice family story, a crochet-along with the character, and I understand that coming up, there's a murder at the crochet convention. It's an interesting read and kept me up way-too-late, as I had a teacher's meeting/luncheon today. Tonight is Crochet In Public at Border's, followed by dinner at Applebee's with some of the group. etc. I'd like to check out what's been happening at Ravely, maybe some chat about Dying to Crochet, also check what's been added on Dee's blog. Earlier this summer I sent an email to my mom that said that while I was in North Carolina I'd like to take a field trip to see this Lace Pottery. We sent emails around to other family members and put it on our Definite Things to Do List. Yesterday we traveled to my brother's home in the Greensboro area, and gathered more family members and loaded up my van. In on this field trip with me were my mom, my sister, 2 sisters-in-law, and a niece. The Lace Pottery store is in Kernersville, which was about 1/2 hour away. Along with looking at all the lovely lace pottery, and most of us selecting one or more pieces for purchase, we were able to see some of the process of making these gorgeous pieces. I purchased two small plates, and hope to have a picture up soon. If you get a chance to see some of Maggie's beautiful pottery don't miss that chance! I left us all hanging after Day 1 of the Conference. I'm going to do a big skip, and get back to Day 2 soon. I spent 3 days at the Conference, 1 day driving to Maryland to spend Sunday with my Mother-in-law. Then we drove back to PA, and spent 2 days unloading the camper, sorting out crochet bags, unpacking suitcases, doing laundry, and then repacking suitcases and crochet bags. Then I spent a day driving to North Carolina where I'm visiting with my parents, my sister is in from Texas, and my extended family is within an hour's driving time. We're having a great visit, and I've got notes on the Conference and will get back to that fun as soon as I can.